I’m starting this post a little differently this week. On Monday morning, I spent some time with a very special dog named Gilbert. 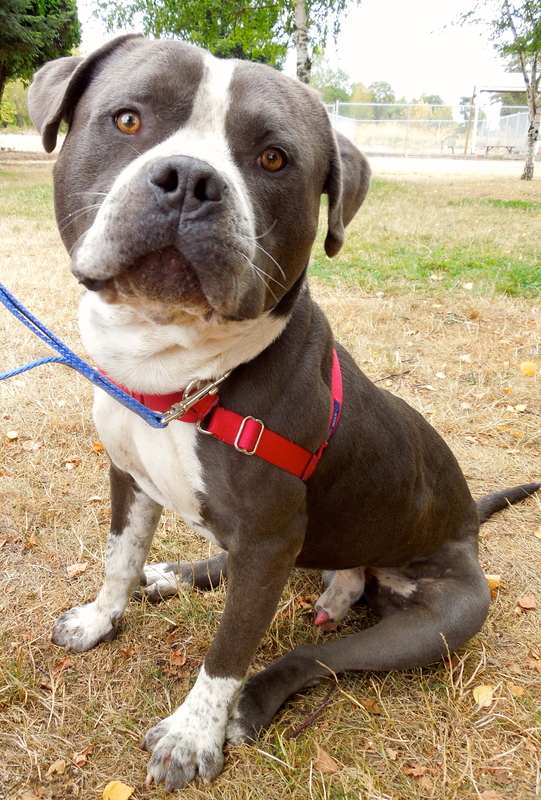 Gilbert, a two-year-old Pit Bull Terrier mix, came to WHS last December as a stray with an injured leg. 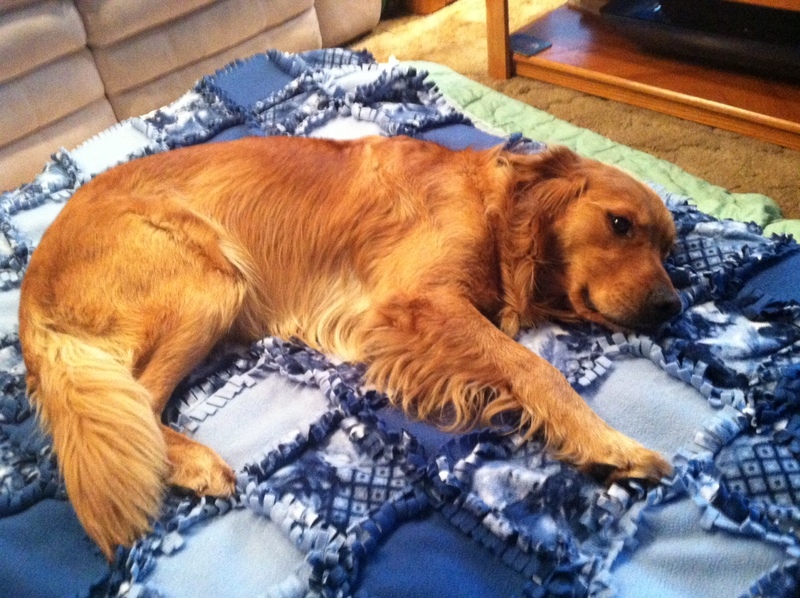 In January he had shoulder surgery and spent several months recovering at volunteer Jolene’s house. 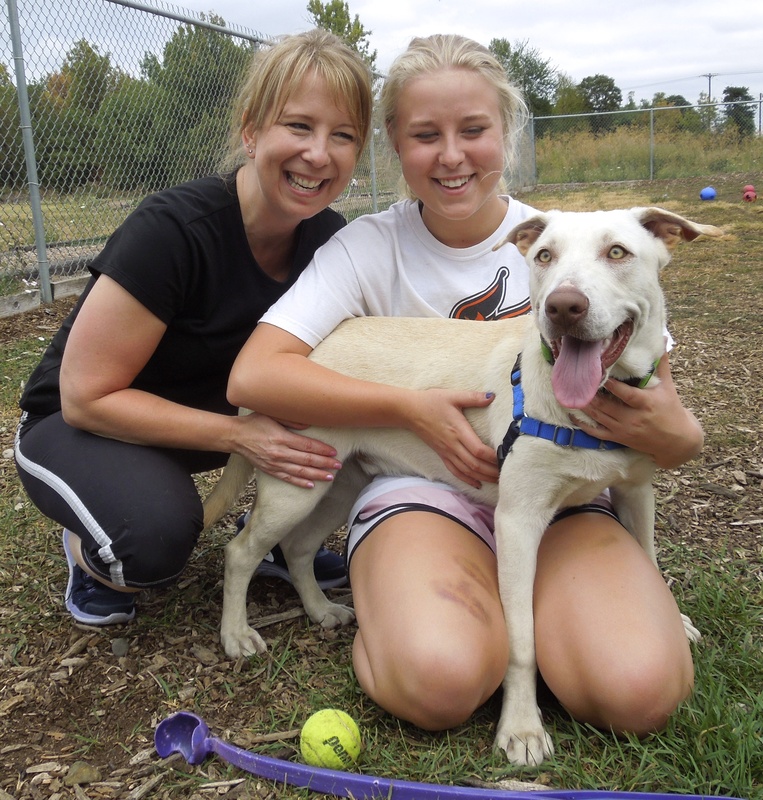 Once he fully heeled, he came back to the shelter for adoption. 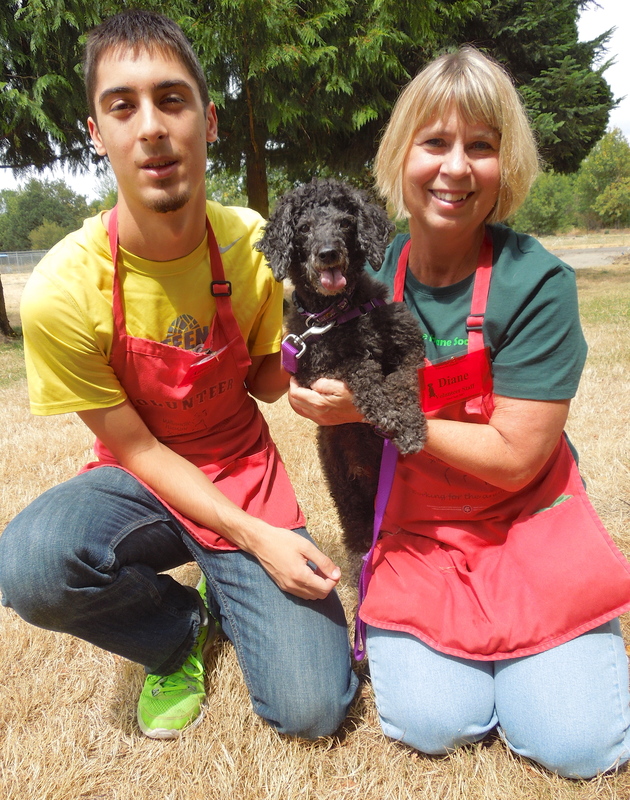 However, for Gilbert, the stress of the kennels was too much, and Jolene agreed to take him back into foster care until a forever family adopts him. 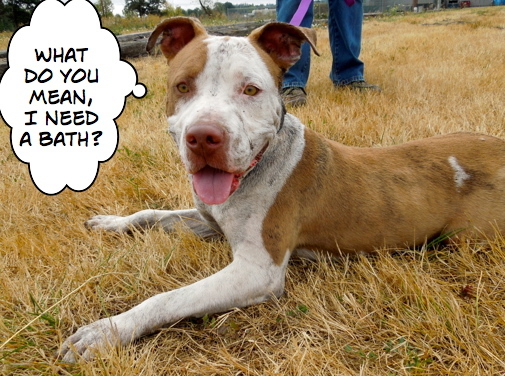 But being in foster means that, except for his picture on the WHS webpage and on my blog, he is invisible to potential adopters walking through the WHS kennels looking for their perfect dog. So that’s why on Monday I drove to Jolene’s house to take pictures and video to make the movie, Gilbert: A dog in need of a home. We’re hoping that many people will see Gilbert in action—living, playing, and hanging out with Jolene’s other three dogs—and that someone will realize that he would be their perfect companion. Here is the movie and some of the pictures I didn’t put in the video, but wanted to show you anyway. Let’s find this boy his forever home! We had more terrific adoptions this week! 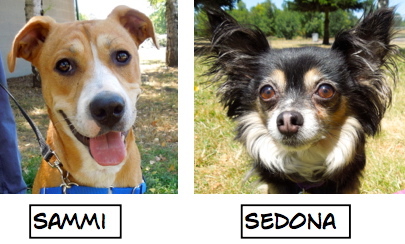 Here are the Blog Dogs who went to their new families. 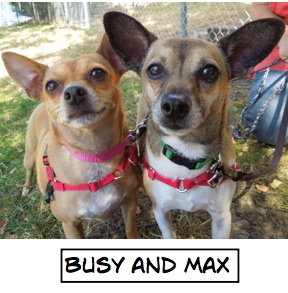 As you have probably guessed, Busy and Max went home together! It’s always such a thrill when a bonded pair go to the same home. Sunday’s play group was a hoot. 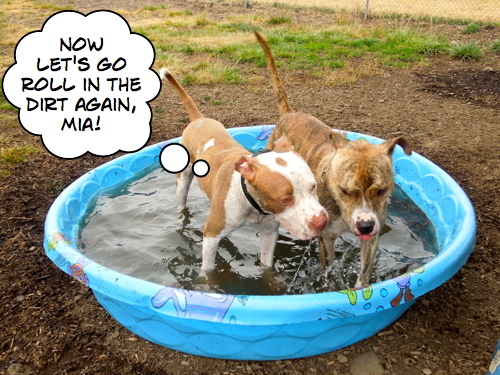 It wasn’t too hot and the dogs were feeling frisky. The star of the show was ten-month-old Scooter, a Pit Bull Terrier mix who romped non-stop the entire time. He’d wrestle with anyone who would put up with his puppy energy. He loved to jump in or over the pool, then roll in the dirt. 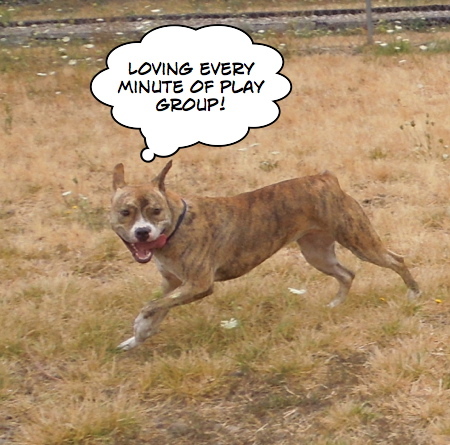 By the end of play group, he was the epitome of Charlie Brown’s Pig Pen! 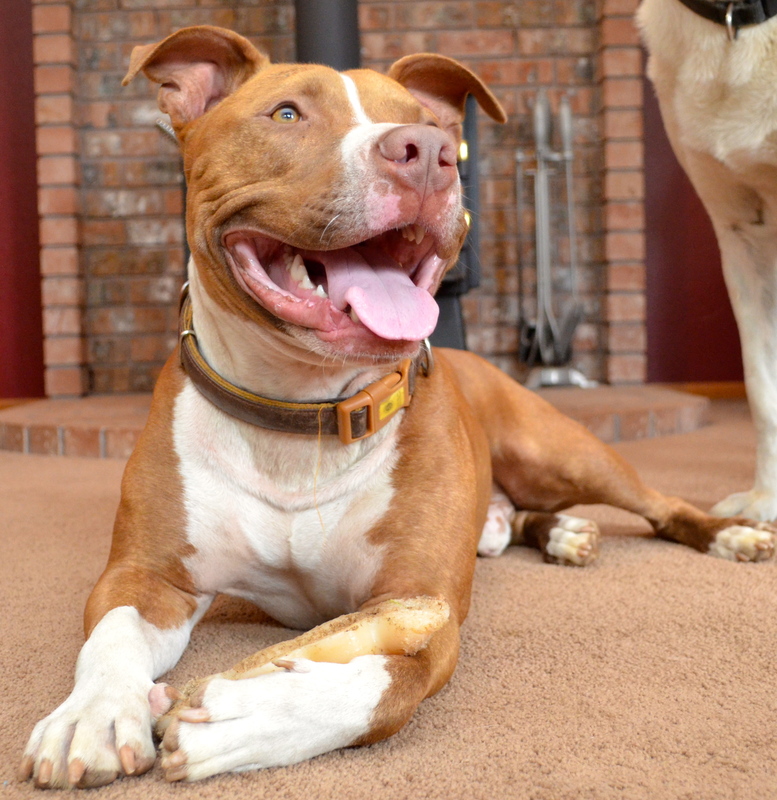 Mia, a gentle one-year-old Pit Bull Terrier mix, was quite patient with the pup and played a lot with him. Mack, a one-year-old St. Bernard/Lab mix, also loves Mia. 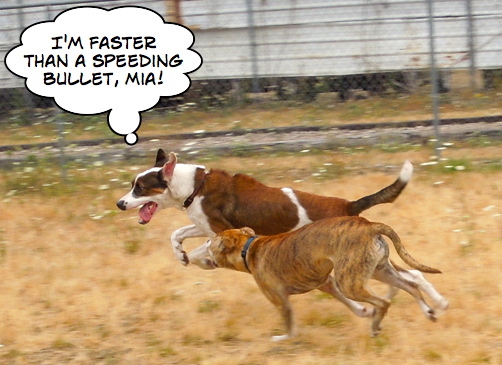 And sometimes Mia just enjoyed the fun of running. 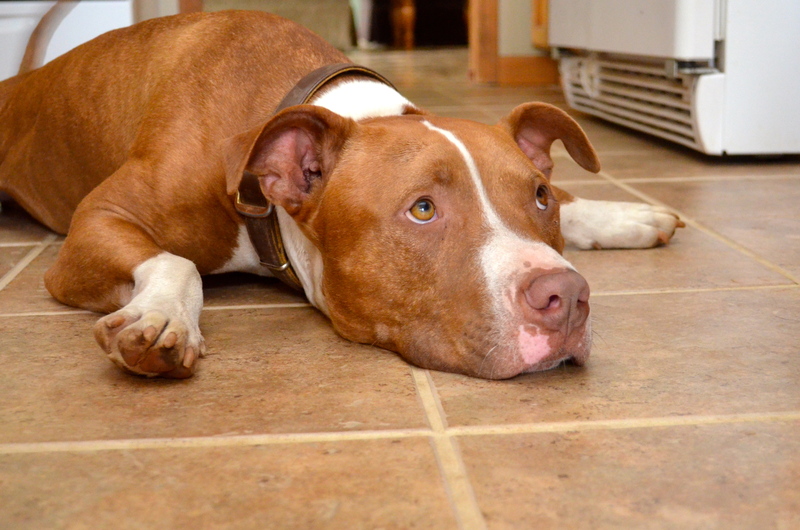 Will, volunteer Linda’s foster dog, has a crush on Gorgeous, a three-year-old Pit Bull Terrier mix. They played chase around the yard. Mia finally had enough of Scooter! And when it was over, Scooter didn’t have a clue why I took this picture. I was happy to see Diane and Andrew out with Curley Pete on Sunday. Pete had spent some time in volunteer Karla’s foster home and she had given him a very badly-needed trim on his face. He looks sooo much better! Pete is a ten-year-old Poodle mix. This is Monte, a nine-month-old Lab/Pit Bull Terrier mix who is a transfer from California and is a Camp Dog for Jr. Trainers Camp this week. This will be his new family after camp. They can’t wait to take him home and he is pretty excited about being an Oregon dog. This is the look I got when I snapped his picture for the WHS website. When I arrived at WHS this afternoon, there were nine new S.T.A.R.T. dogs to take photos of. Sarah showed up to help me, while the other dedicated noon walkers took care of actually walking the dogs. I have a fantastic Wednesday team! In between photo sessions, I snapped shots of the walkers and their dogs. Yes, I have a big head AND a big heart! The first dog I took pictures of today was Rambo, a three-year-old Pit Bull Terrier mix who has the biggest head I’ve ever seen in a dog! Rambo is a happy, playful boy who had both Sarah and me laughing at his antics. 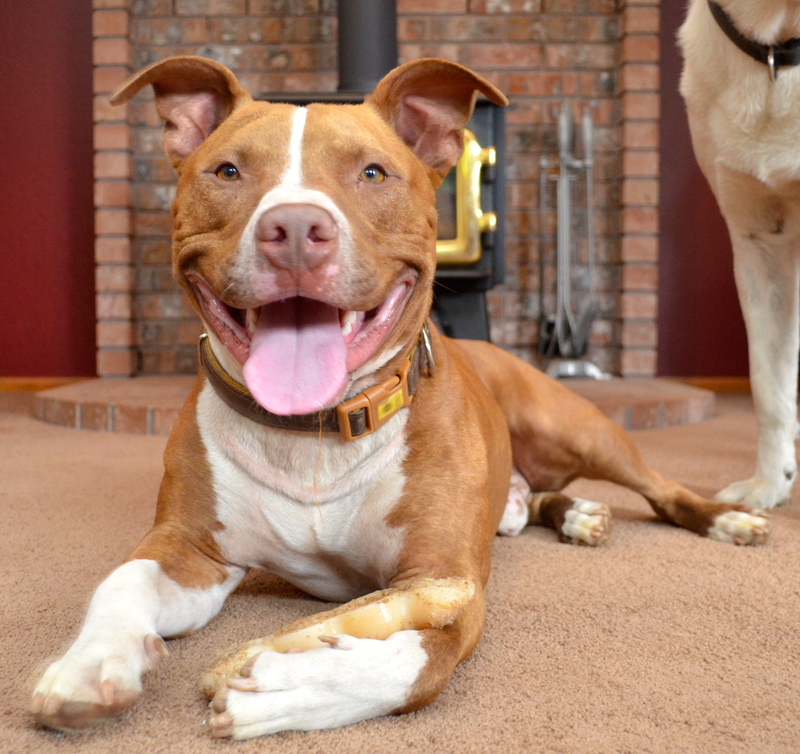 He has lived with other female dogs and children. He’s just a wonderful big lug! Pony is still waiting for you. 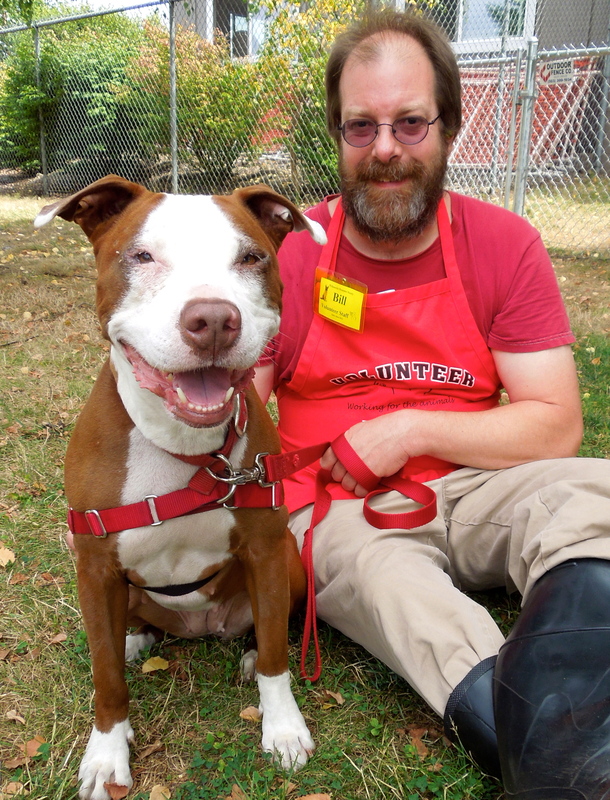 The next dog I saw was Pony with his new best friend, volunteer Bill. Pony has been waiting for his forever home since early June. 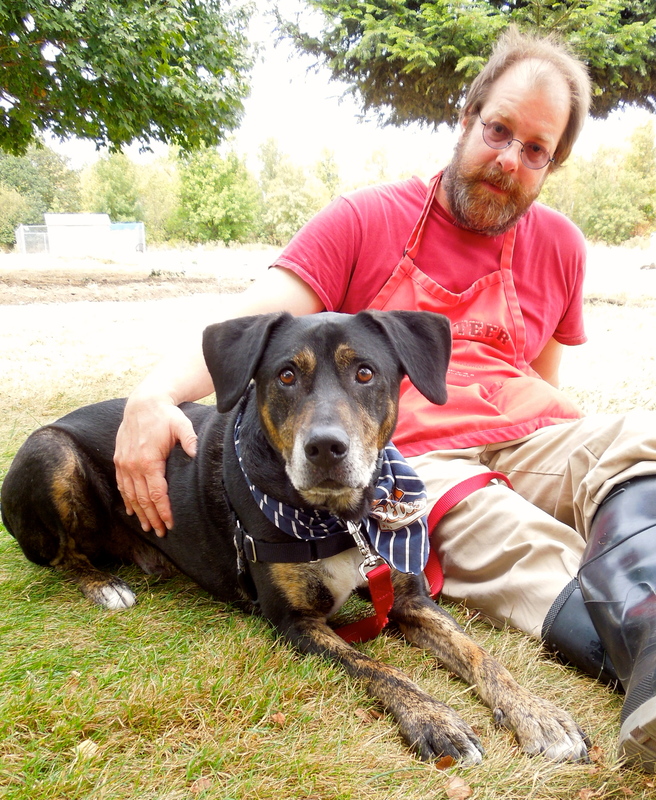 Perhaps it is because of his age (he’s seven) or because he sometimes barks in his kennel (he’s working with Bill on getting better), but he hasn’t found his special person yet. He has seemed depressed lately and another volunteer has sponsored two massages for him which he has thoroughly enjoyed. 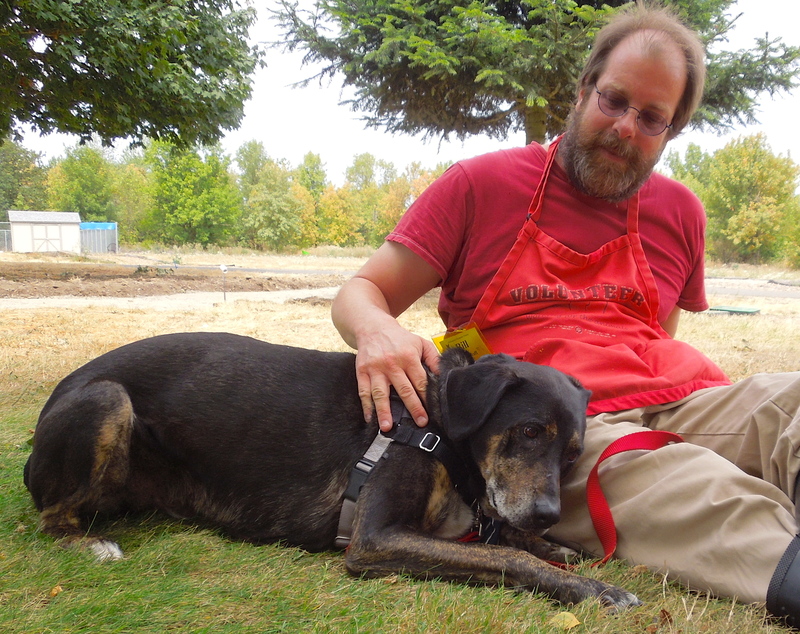 Bill has been putting in lots of time with this Hound Pointer, working on his manners to try to help him get adopted. We’re all hoping that Pony’s forever family will find him soon. Paddles makes a new friend! 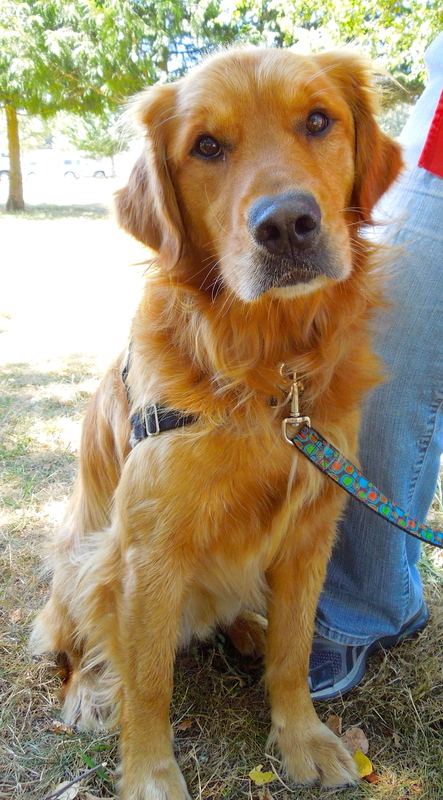 Today our Wednesday walking team welcomed a new member, Angie. 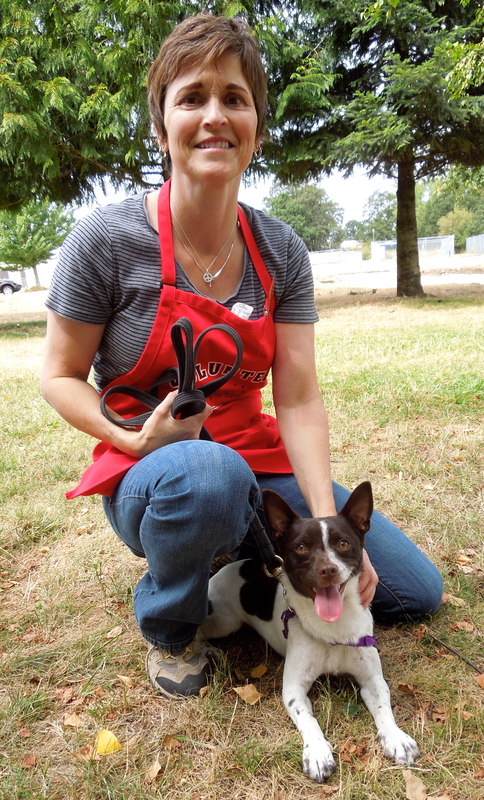 Here she is with Paddles, a one-year-old Chihuahua mix. Paddles has no idea he is a small dog. He seriously believes he’s as big as Rambo. However, he also believes he’s a lap dog and loves to cuddle. 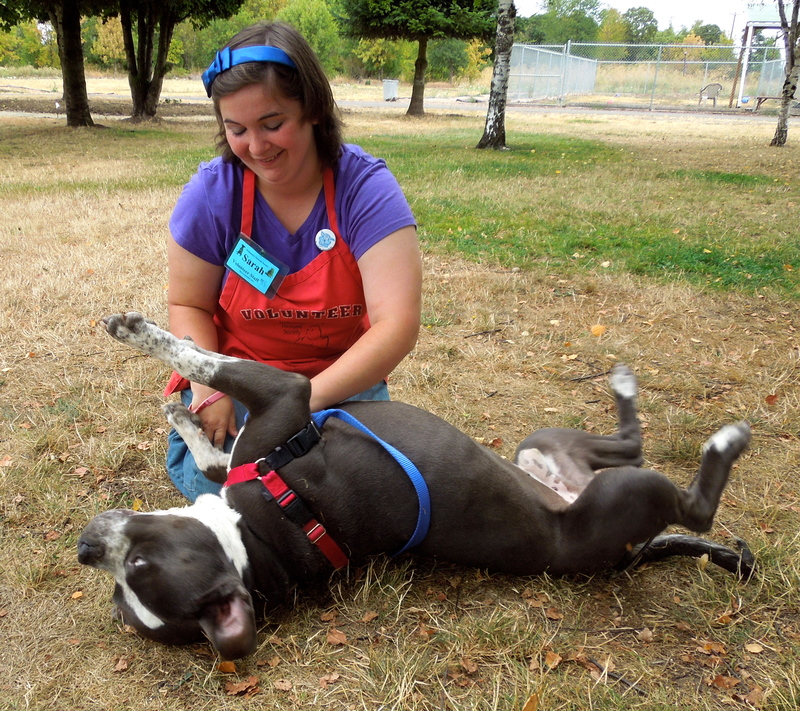 He enjoys play group, however, he’d rather hang around the human helpers more than the other dogs. He’s a cute little man and he’s hoping for a new home. I’m a Camp Dog this week! But I’m still waiting for my new people! 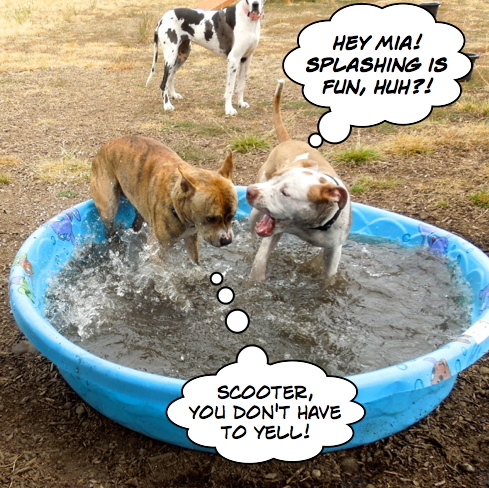 Mia is loving being a Camp Dog with Jr. Trainers. But camp is over on Thursday and Mia will miss the attention. I can’t understand why she hasn’t been adopted yet. 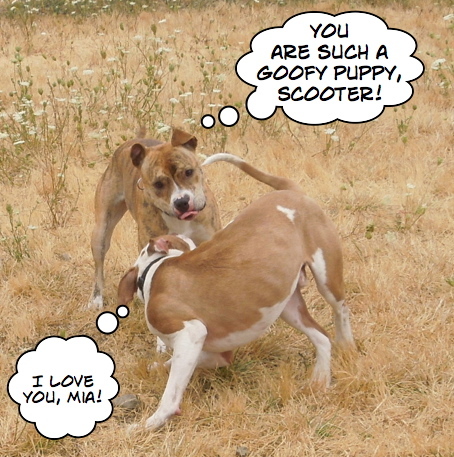 She is a gentle, happy girl who gets along with everyone, as you saw in the play group cartoons. 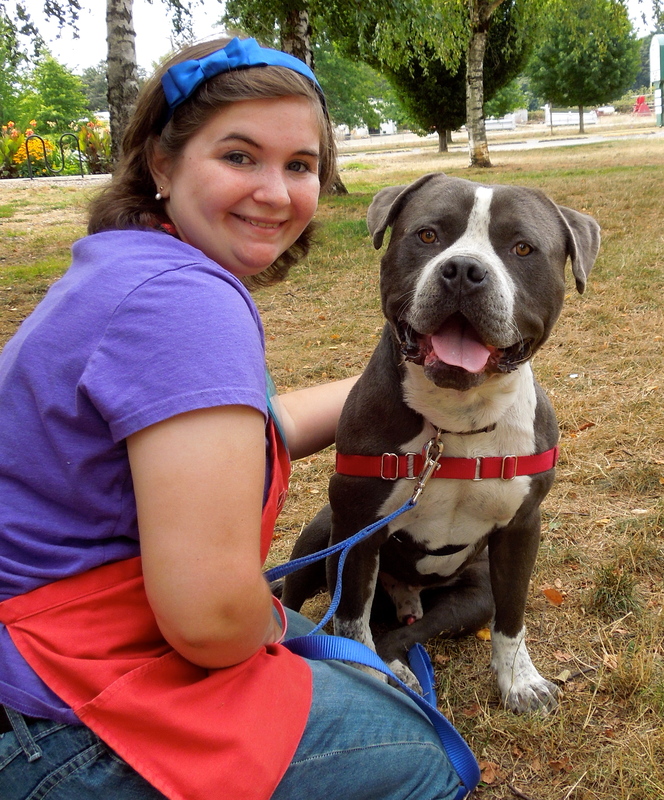 She walks well on leash, takes treats politely, loves children, and knows several commands. Her training in camp has sharpened her skills even more. 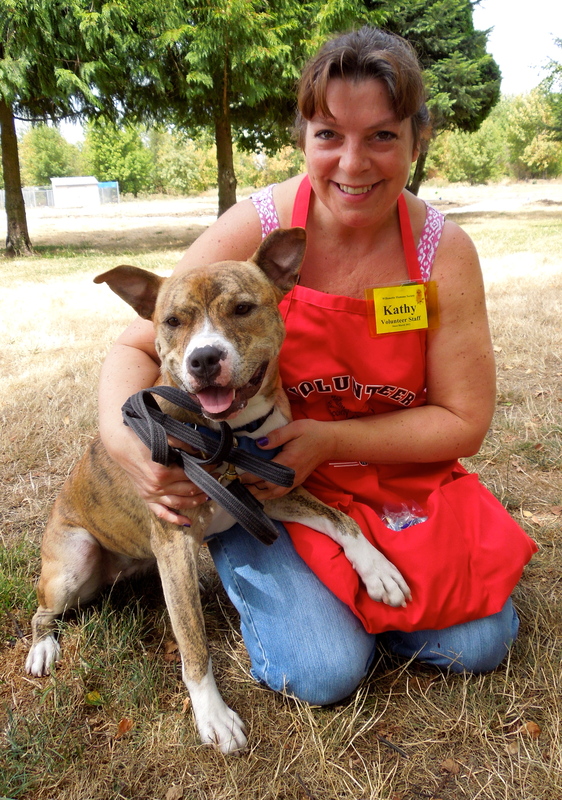 Today Kathy spent time with this wonderful girl. I’m one of Bill’s projects, too! 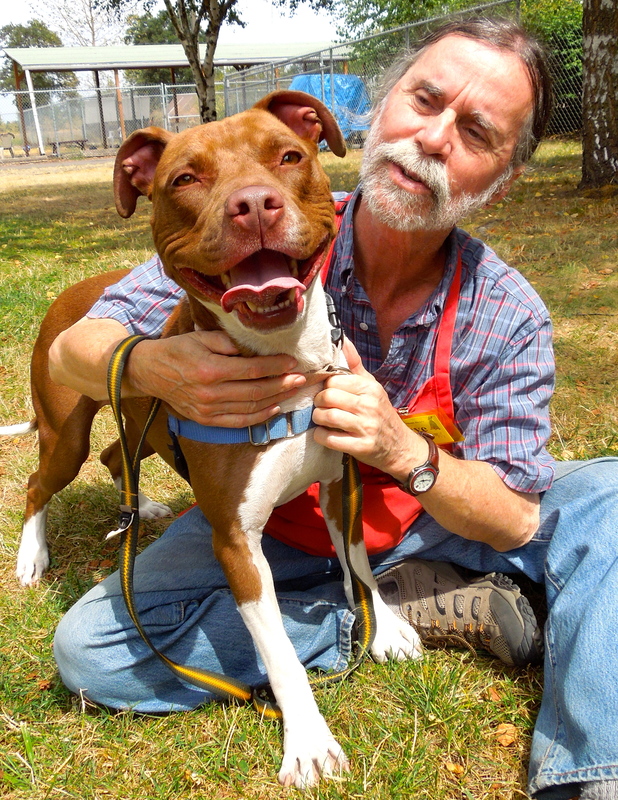 Volunteer Bill has also spent considerable time with another long-termer, Liza. If you read my posts regularly, you have gotten to know Liza well. She is still wearing a dreaded cone (she was very happy to have it removed for this photo) until her eye heals from surgery. 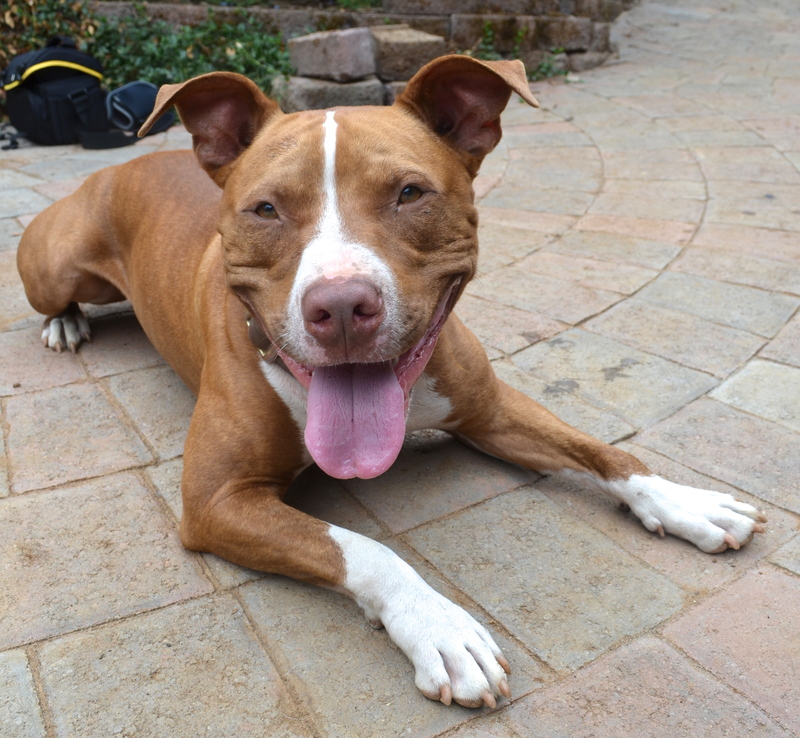 Liza has been waiting for a new home since June 1. She has become quite depressed and Bill has been working to cheer her up. He was anxious to show me the new skills she has learned out in the big yard, but I had so many pictures to take, I didn’t have time. 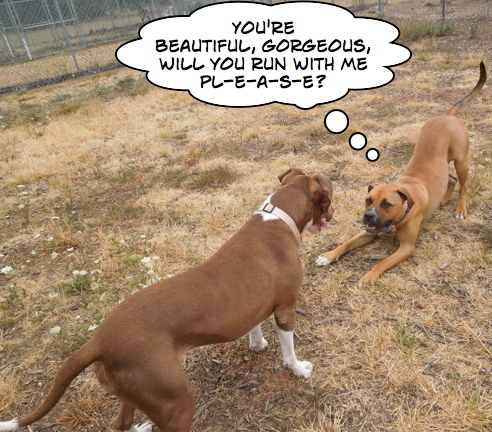 I look forward to seeing them soon…unless she’s adopted sooner! I’ve got my energy back! 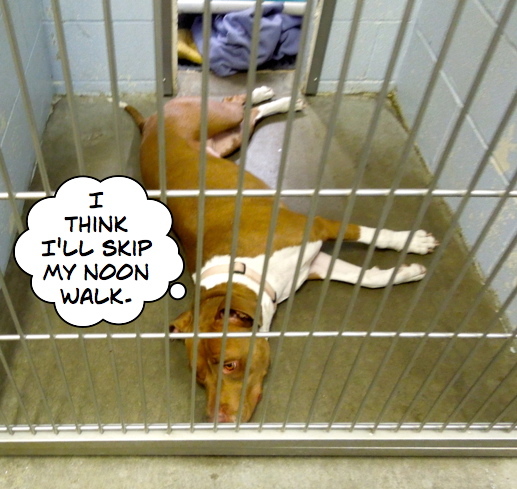 The last time you saw Gorgeous, she was sprawled out in her kennel after play group, exhausted. She was well-rested this afternoon when Steve took her out. In fact, this girl was feeling frisky today. We will be working on better leash manners and impulse control with this bundle of energy. 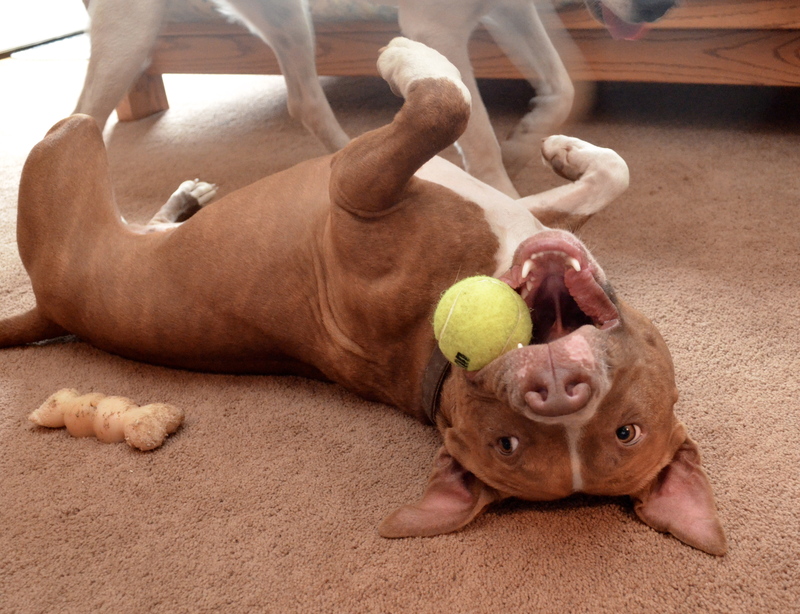 She would love to be in an active family who wants to have adventures. She loved play group and got along with everyone. And she IS beautiful! I was so excited today to see two of last year’s camp girls back again. 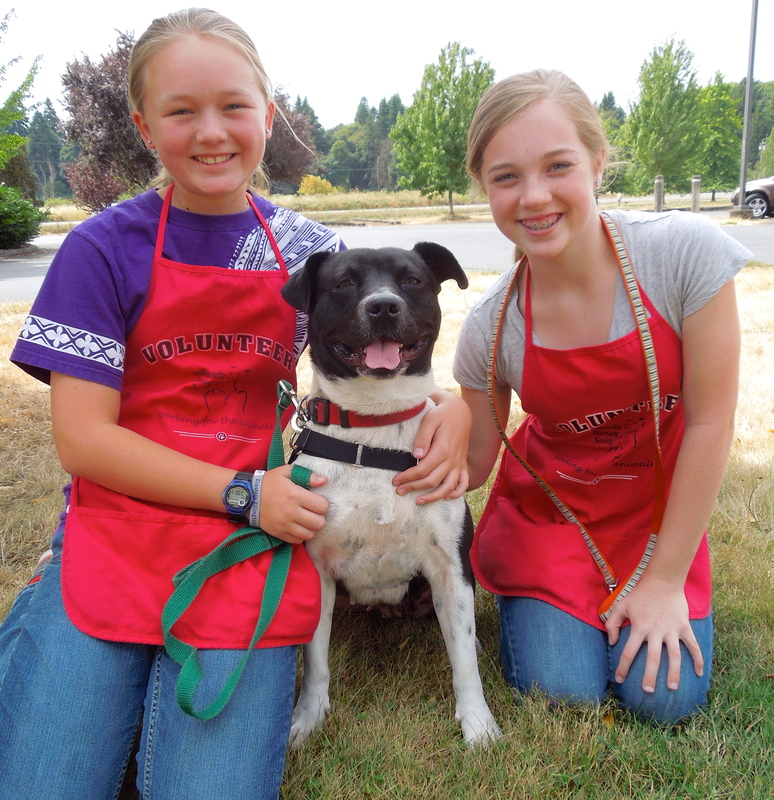 Julia and Lauren are wonderful with dogs and such great helpers. 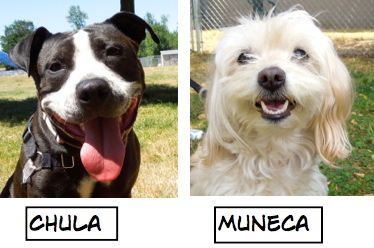 Today they were both working with Julia’s camp dog, Jersey, a three-year-old Pit Bull Terrier mix. All three were happy to pose for a picture. Here is Blitz when he arrived at WHS a few weeks ago. 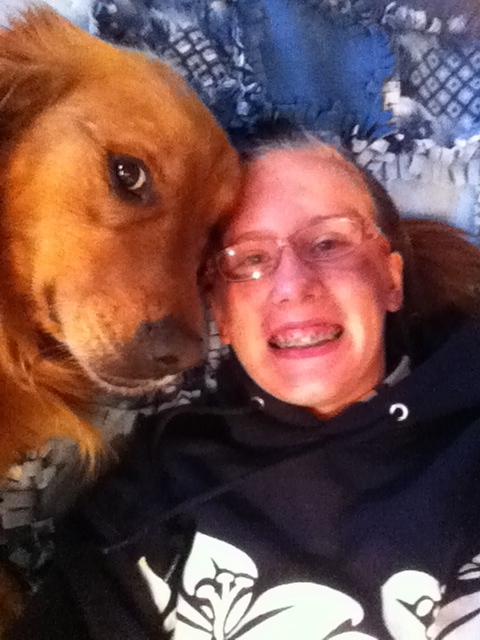 Harley, a devoted WHS volunteer and animal lover, along with her grandmother, adopted Blitz, a Golden Retriever, in early August. Here is her update. Here are a few pictures from my house and my new amazing “pawsome” BFF 🙂 This is Blitz (his name used to be Griffin). He is my baby now. I love him to pieces, and he’s so gentle and sweet. My grandmother and I are going to continue his obedience training, which shouldn’t take too long. Then we are getting him registered as a Candy Striper at the hospital and retirement homes! He is having a great time going in the car and visiting new people. He hasn’t met a person he hasn’t loved! 🙂 I am so thankful to get this amazing BFF. Thank you to all the wonderful volunteers and staff at WHS who let me get this sweet boy! 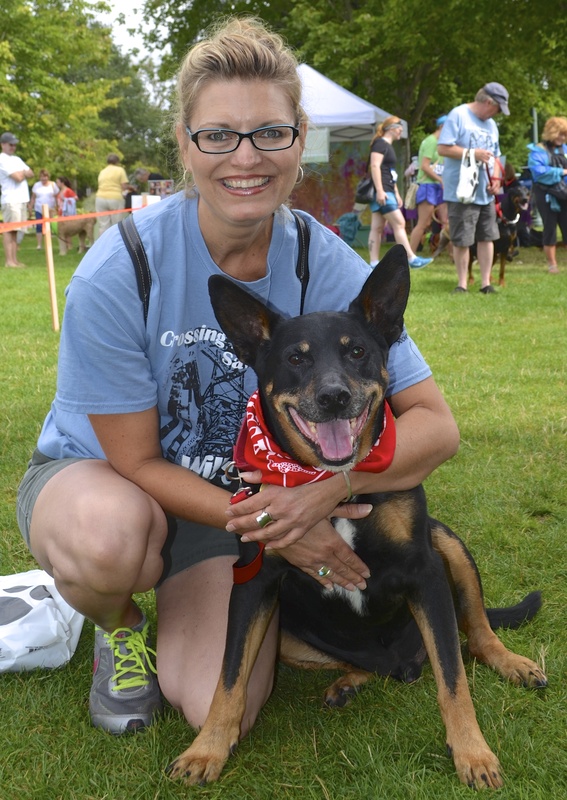 At the WillaMutt Strut on August 3, I took this picture of Melinda, a loyal reader of my blog, and her dog, Shane. Melinda happened to mention that Shane was a WHS alumnus and I jumped at the idea of an update. Melinda was very happy to write about her best friend. Here is her update. 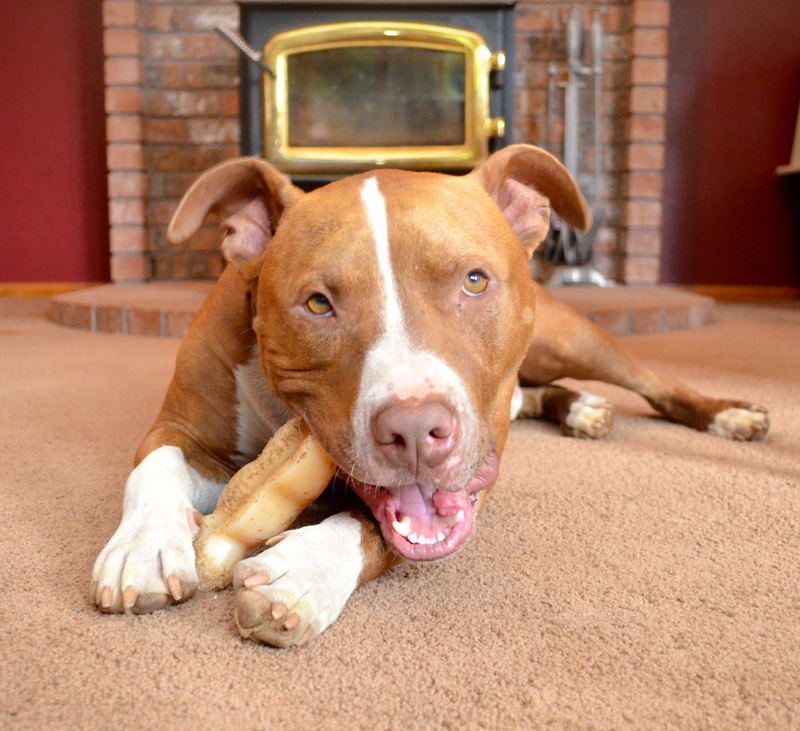 “When we purchased a home 11 years ago, we decided it wasn’t complete without a dog. After many trips to the Humane Society, Nancy Sanchez called to say she had the perfect companion for my mom and me. The night we visited Shane, then called Lincoln, it was close to closing time and we just weren’t sure about taking him home. Fortunately a quick-thinking employee said, “Why don’t we hold him one more day so you can think about it?” The rest is history. Shane has been the most wonderful boy we could have ever asked for. 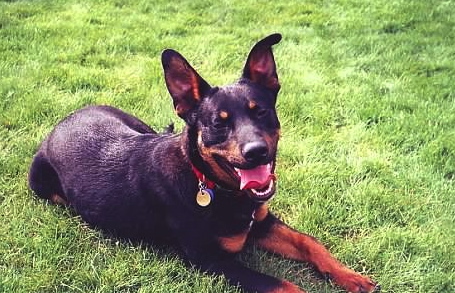 Our best guess is that he’s a Doberman and Cattle dog mix, and I always say he’s as smart as a three-year-old. His loyalty, devotion, and love can’t be matched. Even at age 11, Shane still plays ball at the dog park every weekend, loves his daily walks and will give high fives any time you ask. He has helped raise dozens of foster kittens that have been through our home and he has been an amazing representative of the quality dogs you can find at a shelter. Melinda sent along a picture of Shane at nine months. 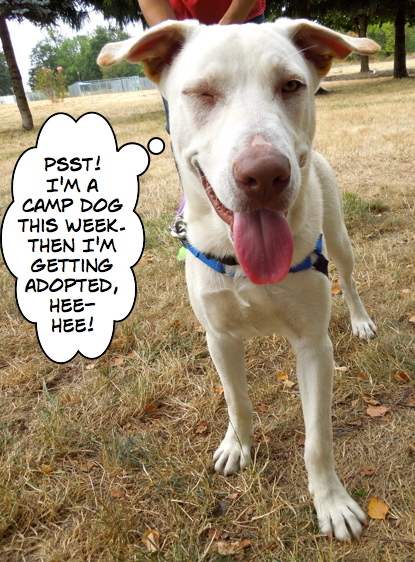 What a lucky shelter dog! 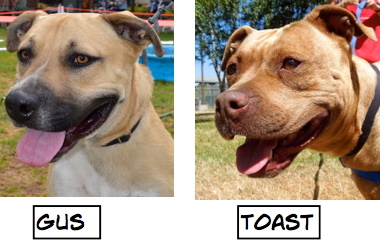 I won’t be writing a post next week, but will be blogging about our WHS shelter dogs again on August 28. I hope to report on many adoptions! Wonderful post, Martha! They ALL are, of course, but I particularly liked this one. I walked Gilbert. I walked him when he was at the WHS.